With the family sedan market flooded with a wide range of cars to suit every need, you don’t have to pay for a luxury sedan if you want a refined, stylish, and powerful car. If you look in the right place, you can get a budget car that packs all the features of a luxury sedan at a reasonable price. The Nissan Maxima is a prime example. It combines style, luxury, and practicality, and give other high-end sedans a run for their money. The 2017 Nissan Maxima is a five-passenger midsize sedan that comes in five trim levels: S, SV, SL, SR, and Platinum. Some of the standard features on all trim levels include 18-inch alloy wheels, automatic headlights, fog lights, LED running lights, keyless ignition and entry, dual-zone automatic climate control, eight-way driver and four-way passenger seats, cloth upholstery, a 60/40-split folding rear seat, an auto-dimming rearview mirror, and a leather-wrapped tilt-and-telescoping steering wheel. The 2017 Maxima is powered by a 3.5-liter V6 engine that gives 300 horsepower and 261 lb-feet of torque. The vehicle also boasts of front-wheel drive and a continuously variable automatic transmission (CVT). The Maxima scores well on the safety features. Some of the standard options include antilock brakes, traction and stability control, front-seat side airbags, side curtain airbags and a rearview camera. SL and above also have blind-spot monitoring system, rear cross-traffic alert and a forward collision warning and mitigation system with automatic braking. The Platinum also gets a 360-degree parking camera system, driver drowsiness monitor and Nissan Connect, which includes automatic collision notification, remote starting, stolen vehicle locating, and emergency calls. The interiors are complete class and quality, with soft-touch surfaces and Nissan’s ‘Zero Gravity’ seats. The Maxima offers decent comfort and room, easy-to-use touchscreen tech interface, and smartphone integration for Apple. Front and rear legroom are average but much smaller than most other sedans. The 14.3-cubic-foot trunk is similar to the cargo space of entry-level luxury sedans but much smaller than that of competitors. Driving the Maxima is smooth and powerful, thanks to the V6 engine. Quick acceleration and comfortable handling make the Maxima sporty and fun, and the safety features make the ride safer. 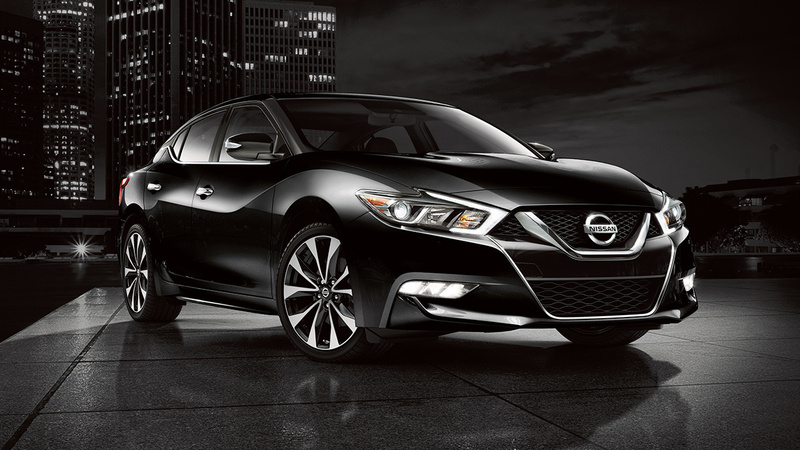 The 2017 Nissan Maxima offers the quality of a luxury sedan at the price of a budget car. Even though the midsize sedan market is flooded with several offerings from different brands, the Maxima stands out with its style, features, and performance. Let New York Autobrokers serving the Brentwood and Islip area use their 20 years of experience to get you the best lease payments or price on any car make or model of your choice. Call us at 631-446-4455 for more information!